Maryland has some of the most haunted places in the country. Maryland's haunted history is tied to several battlegrounds, the American Revolutionary War, War of 1812, and the Civil War. Besides phantom soldiers wandering bloody battlefields, many of the haunted places located in Maryland include spooky apparitions from other sites of misery and horror, such as universities, cemeteries, parks and a few taverns. It's referred to by the US National Park Service as the site of the "Bloodiest One Day Battle in American History." On September 17, 1862 during the Civil War, 23,000 soldiers were "killed, wounded or missing" on the Antietam Battlefield. The battle lasted 12 hours. 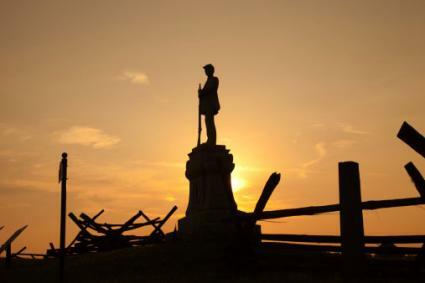 This battlefield is considered one of the most haunted places in Maryland. As a haunted battlefield, it is second only to Gettysburg. According to Ghost Village, visitors report hearing "ghostly shouts and whispers" and the sound of "clashing metal." Bloody Lane, where the Union army Irish Brigade attacked the Confederate troops positioned in this area, is said to be haunted by those slaughtered. The Irish battle cry shouted in Gaelic, "Faugh-a-Balaugh" (Clear the Way) has been heard by some. During an investigation, Ghost Research reports their team captured several EVPs within the battlefield area. One EVP is "a sound reminiscent of a musket or gunshot in the distance." While inside the Mumma House, the team recorded what they believe "...sounds like someone saying, 'Get out.'" The Visitor Center is located at 5831 Dunker Church Road, Sharpsburg. The Visitor Center and Park Grounds are open all year. 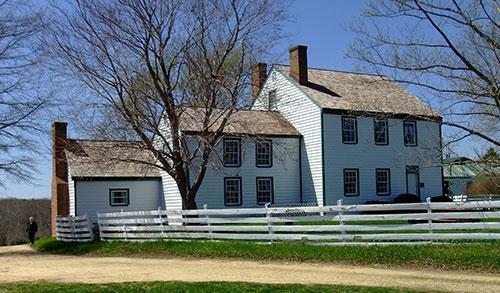 Piper House was Confederate General Longstreet's headquarters, and the barn was used as a field hospital during the Antietam Battle. Military Ghosts reports the house was directly on the battlefield and after the fighting stopped, three dead soldiers were found under the parlor piano. There have been reports of "strange sounds and mysterious figures that appear and vanish without explanation." Piper House was closed to the public and operated as a Bed and Breakfast Inn by Lou and Regina Clark who leased it from the park. The owners never experienced any paranormal activity, but guests reported hearing muffled conversations, odd sounds and misty apparitions in the 1900 addition to the home. Guests reported, "...hearing muffled voices and odd sounds and even report a misty apparition which appears in the doorway to the bathroom." The Piper House is located on Route 65 just before the Visitor Center. Check with the Antietam Battlefield Visitor Center for operating hours. Another farm along the Antietam Battlefield was also turned into a field hospital along with the barn that was about 100 yards from the house. The Otto House rests on a knoll along Burnside Bridge Road and overlooks the Sherrick House. 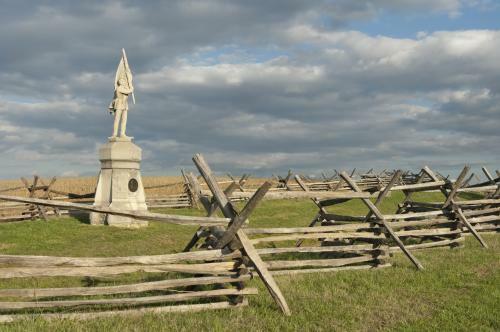 A February 1997 article on the Herald-Mail website tells about a recent ghostly apparition witnessed by two park rangers at the Antietam National Battlefield as they were making their nightly rounds. When the two rangers approached the Otto House, they were shocked and terrified by the "blue-tinged, translucent figure in the open doorway of the building." The park rangers fled to the Burnside Bridge before stopping to discuss what they'd seen. Each reported the same sight of "a Southern belle in a hooped skirt standing in the doorway as if looking toward town." The Otto House is located on Burnside Bridge Road, Sharpsburg, Washington County. Check with the Antietam Battlefield Visitor Center for operating hours. During the War of 1812, a deciding battle (Battle of Baltimore) was fought in 1814 in defense of Fort McHenry. This battle stopped a British invasion. It was during the battle that Francis Scott Key penned an anthem titled Defense of Fort McHenry that was later re-titled to The Star Spangled Banner - the American National Anthem. The fort was used as a military prison during the Civil War. Security guards have witnessed uniformed soldiers holding weapons and walking about the fort. Strange noises have been heard coming from the dungeon area where prisoners were kept. Visitors have reported the feeling of being watched. Shadow figures are seen about the fort. Crying has been heard as well as the sound of distant drums. A dark entity has been reported by workers inside the fort, and there have been reports of this entity attacking others. 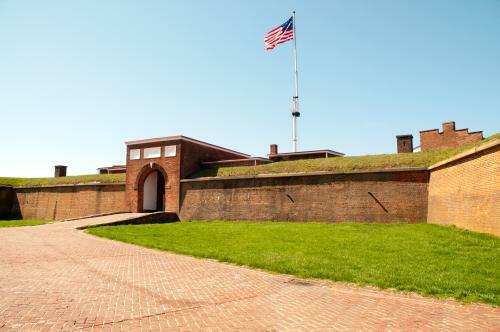 Fort McHenry is located at 2400 East Fort Avenue, Baltimore. Check the Fort McHenry website for operating hours. 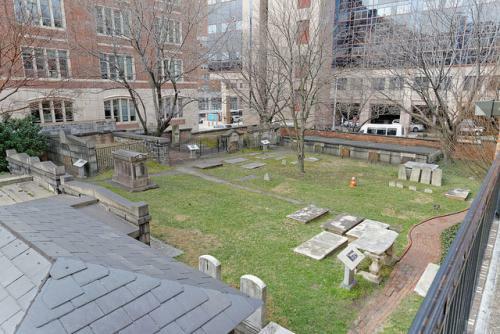 The Old Western Burial Ground, also known as the Westminster Presbyterian Churchyard, is said to be haunted. There are catacombs beneath the haunted cemetery and under Westminster Hall which provide fodder for ghostly tales. Several famous historical figures rest here including Edgar Allan Poe, generals from the Revolutionary War and the War of 1812, President James Buchanan's grandfather and five former mayors of Baltimore. Some visitors have sworn to have seen Poe and even conversed with him. Others have reported seeing him in the catacombs. The cemetery is certainly known for its paranormal activity and considered one of the most haunted places in America. Some of the stories include several people who were buried alive and now wander in spirit form in search of those who buried them. The Screaming Skull of Cambridge is buried here and is said to have belonged to a minister who was murdered. The skull was supposedly buried in cement to muffle the man's screams that continued to come from the skull. Witnesses say the screams can be heard at all hours of the day. Upon hearing the screams, several people are said to have gone insane from terror. The Old Western Burial Ground is located at 509 W Fayette St, Baltimore. It is open to the public and you can call (410) 706-2072 for operating hours and more information. The Middleton Tavern was established in 1750 and hosted many of America's founding fathers including George Washington, Benjamin Franklin, and Thomas Jefferson. It was a favorite meeting place for the Continental Congress. It's speculated that it was the probable site for great Americans celebrating the election of James Monroe as President since his host, Annapolis Mayor John Randal, was the Tavern's owner. The Tavern hosted other meetings for groups, such as the Free Masons, the Maryland Jockey Club and the Tuesday Club. According to many witnesses, the Tavern is still host to some very distinguished visitors, only these are in spirit form. Numerous ghosts are said to be haunting the establishment. One ghost is said to be a Revolutionary War soldier who tosses dishes. A shadow man moves furniture. An old sailor sits staring out at sea. An unknown Revolutionary-garbed entity the staff calls Roland haunts first floor dining rooms. One entity is announced by the smell of cigar smoke though there is no smoking permitted in the tavern. The Middleton Tavern is located at 2 Market Space, Annapolis. Operating hours can be found on its website. Point Lookout State Park was a prison camp during the Civil War known as Camp Lincoln which held confederate prisoners, especially those wounded at the Battle of Gettysburg. Camp Lincoln was the largest Union army prison. The camp suffered a smallpox outbreak and the infected were placed in the "smallpox unit." Steeped in history, Point Lookout is an ideal setting for ghost stories. In 1830 a lighthouse was constructed and quickly contributed to what many believe is a highly haunted area. The ghost of a Civil War soldier walks across the road away from the smallpox unit. A gaunt-looking man in homespun ragged clothing repeatedly runs across the road as though escaping the smallpox unit. Witnesses report that a prisoner apparition notices them but continues to run away. There are reports of pungent smells of gunpowder and mildew that fill the air when the men are sighted. 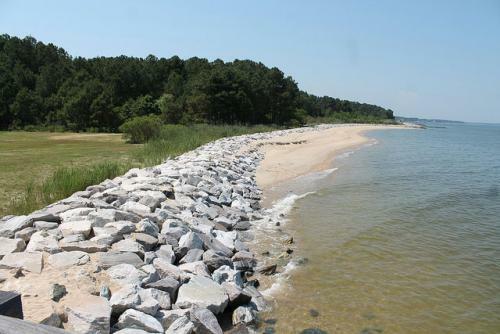 Point Lookout State Park is located at 11175 Point Lookout Road, Scotland. Check their website for operating hours and fees. This historic home is operated as a museum by the Samuel Mudd Society. Dr. Samuel A. Mudd upheld his oath and treated John Wilkes Booth, who'd broken his leg from a fall soon after he assassinated President Lincoln. Mudd was imprisoned for aiding the fugitive, charging the doctor as a co-conspirator in Lincoln's assassination. Mudd continued to serve others while in prison, tending to those stricken with yellow fever. His wife spent years in a relentless attempt to gain a pardon for the doctor. Finally, President Andrew Johnson pardoned Mudd. Unfortunately, the severity of prison life had weakened the doctor's health and he died at his home soon after his release. Sounds, including Dr. Mudd claiming "I am innocent." The Dr. Mudd house is located at 3725 Dr. Samuel Mudd Road, Waldorf. Visit the website for operating hours. St. Mary's was designated to be a tavern, but instead the building was sold in 1866 to the Redemptorist Seminary. The church provided services to the nearby Catholic communities. The setting was isolated and the building was surrounded by woods.The church later became St. Mary's College for men. In 1972, due to lack of enrollment, the school closed. Vandals set fire to the building in 1997 and little remains of the church and school. The ruins are overgrown, but can still be partially seen from the road. Over the years, a story of a murdering priest has grown and the school became known as Hell House. The story goes that a priest murdered five females and reportedly hanged the girls over a pentagram on the first floor. He then killed himself. The stories of ghosts continue to haunt the buildings with many people claiming to have witnessed paranormal activity. The ruins aren't safe and should not be explored in the search of ghosts. The sensation that someone is following. The top of the staircase has cold spots. Screams and cries of the murdered girls have been heard. The ruins are near Ilchester Road and Bonnie Branch Road in Ilchester, but they are not open to the public. The ruins are too dangerous to investigate. The site of an Indian massacre occurred along the Choptank River, but it was at Bachelor's Point where the remaining tribe met their death. An Algonquin tribe had a settlement at Bachelor's Point and the warriors set out for battle. Most of the tribe warriors were slaughtered in the fight, but those who survived returned to their settlement at Bachelor's Point. They knew the women and children were vulnerable to their enemy. Knowing that the warring tribe was on their heels, the warriors gathered the women and children along the river bank. They all held hands and began to chant as they moved closer toward the water's edge. They entered the river and were swept away, drowning in the currents. Witnesses have reported hearing their death chant floating over the river. The site is located at the Wharves at Choptank Crossing, 10219 River Landing Road, Denton. The area is open to the public at all times. There are many haunted places in Maryland with significant historical ties. You can explore those places that are open to the public and possibly experience your own ghostly encounter.